If you don’t want your house and ceilings to flood up with dirty water then it is very important to properly maintain your gutters. Even if there is a slight problem that is being overlooked by you, then prepare yourself for a complicated situation in near future. We are a well-known gutter repair company providing our services for more than ten years throughout Woodbridge. 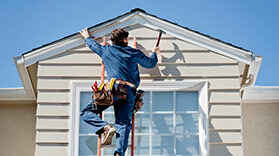 Our workers are expert in repairing every problem ranging from failing joints to blocked outlets. We offer the most affordable rates and supreme quality service in shortest possible time. 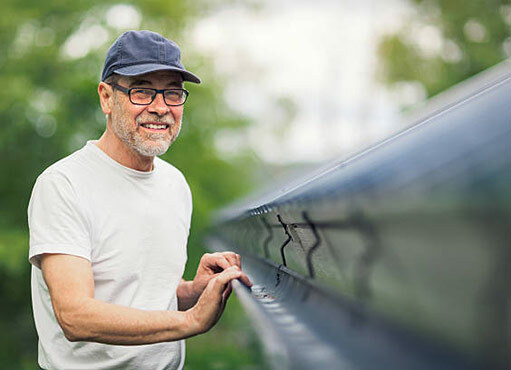 If your gutters are not working properly then it may be due to faulty installation, corrosion of the members, loosened joints or any other problem adding strain on seams. Deterioration of the sealing agent of joints results in leakages from the seams, known as seam failure. The adverse effects of seam failure include moisture in your walls providing damp environment for mould to grow and flooding in basements. Our experts are well experienced in seam repair and other associated problems. Seams can be repaired by mending joints of failed sections. It is the most efficient method to quickly deal with leakage problems. Your gutters require regular inspection and regular maintenance. If you are ignoring a little mal-functioning of your gutters, you should prepare yourselves for bigger and costlier problems that may arise. For example, sagging is a little problem in the eyes of many, but if left untreated, it may lead to loosening of joints resulting in gaps filled with mud and debris. NICK’S Window Cleaning professionals are expert in repairing sagged gutters and other problems that arise due to it. To ensure that your gutters are working properly, you should get them inspected at least twice a year. During winters, there is a greater load on the gutters due to falling leaves. The leaves if not taken out in time will decay into a dirty muddy matter which provides a habitat for germs, fungus and insects. It also increases the weight on gutters. In all cases, commercial gutters are affected more than the normal home gutters. That is why they require more frequent inspection and maintenance than normal gutters. We have been providing all sorts of repairing services to large residential and commercial gutters throughout Woodbridge. You can also contact us directly and get information and guidance about our commercial services. We are a well-known and reputed company for works for all sorts of gutter repair services. Our workers are well-experienced and well trained and have WSIB coverage. We respect and value our customers and our workers do not leave behind any mess after working. We provide fast service throughout Woodbridge with the most reasonable rates. We have more than ten years of experience in gutter repair and restoration services. Our customers are always satisfied with the quality of our work. We also provide a free estimate of the repair work, so that you can easily make the right decision about selecting our services. Gutters are an important component of your home. If you want to maintain the cleanliness and appearance of your house then pay attention towards their maintenance by hiring experienced professionals. If gutters are clogged with leaves or something else, it will soon be mixed up with rainwater making the matter heavier. This additional weight can deform the structure of your gutters and result in sagging. Sometimes gaps are left in the joints due to faulty installation. If they are left untreated then they would surely have serious consequences sooner or later. The matter stuffed in those gaps is not easy to remove. Water will find its way to enter your foundations and will lead to moisture accumulation in walls and foundations. If you want to clean and repair your gutter by yourself then you are putting yourself and your property at risk. You need the proper equipment and knowledge for this process. You can even buy the instruments but you can’t buy the experience of the industry professionals. So, hire a professional crew for this purpose and avoid yourself all this trouble.